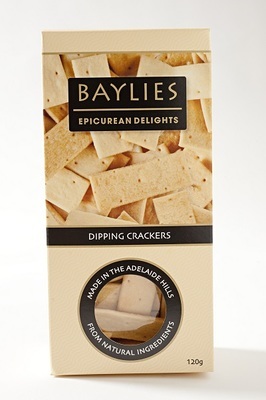 Baylies Dipping Cracker served with dips and a glass of Adelaide Hill Rose is the local choice for outdoor glamping! Spring has arrived in the Adelaide Hills and makes the perfect destination for your next glamping or picnic adventure. Outdoor concert or evening at the beach, just got a whole lot more gourmet thanks to some clever packaging devised by our French-trained, Adelaide Hills based chef, Robert Bell. 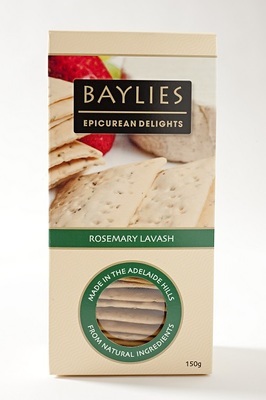 Robert is not one for roughing it too much, so he's made sure the Baylies range of Lavash comes in a ready-to-serve tray so you don't have to lower your gourmet standards when eating away from home. Packaged into trays, there is no need to take extra plates, simply serve the lavash in the tray with your favourite picnic hamper or platter of choice. Let us know your favourite Baylies lavash and dip combination on our Facebook page and we will post these ideas on our page. You've invited the boss around for dinner. It's a bold move but that's exactly where Baylies products contribute for success! A busy day at work leaves little time to cook a meal to impress the boss. What's the solution? Try a delicious picking plate..
Baylies Lavash for a base topped with roasted capsicum and feta cheese. Baylies Sweet Tart shells fill the tart shells with lemon curd, top with meringue and bake on low temperature for ten minutes. Seasonal parties such as Christmas try our Christmas pudding warmed served with brandy cream, custard or ice-cream or all three. Use any of our Lavash or Cracker range to serve with your favourite cheeses. Refer to Cheese Pairing Blog on the best cheese to suit our Lavash range. Refer to our recipes page on our website for more ideas. When you're planning a cheese platter with the Baylies range of Lavash, you have a wide palate of flavours to work with. Let's look at each Lavash style and give you some cheese options. Baylies Plain Lavash is your perfect entertaining backup plan. Quite simply, Plain Lavash can be paired with any type of cheese. For a more nutty flavour, we opt for Chevre or, when we're feeling more daring, we've paired Lavash with a marinated Chevre. When pairing our Pepper Lavash, be mindful that its flavour needs to work with the cheese you choose. A safe option is to go with a mild creamy cheese, such as Brie or Camembert. Of course, another aspect of choosing Lavash with a strong flavour like Pepper is that it can hold its own when matched with equally strong and bitey cheeses. For example, Baylies Pepper Lavash paired with strong or smoky cheddar is pure delight, and the joy is unbound when paired with a light blue vein, if that is something your palate enjoys. Just like the Pepper Lavash, the Rosemary Lavash works nicely with brie and camembert. But something that might surprise you, the fresh rosemary flavour, works extraordinarily well when paired with sweeter notes in fruit cheeses. If you like culinary adventures, put this claim to the test by picking up your favourite fruit cheese, like walnut and apricot, and pair it with our Rosemary Lavash. Baylies Dipping Crackers are a good size to simply dip and eat. It's a versatile cracker for those who want more cheese than cracker. We would love to hear your feedback and take any further suggestions for pairing our delicious range of Lavash with your favourite cheese or dip.